I’m sure it surprises no one that I was shocked to see Marquette come out on the 11-line on Selection Sunday. I thought we’d probably be an 8 or 9, 10 at the worst. And it was only more galling to see four Big Ten teams with loss totals in the teens seeded ahead of us: Michigan, Illinois, Michigan State, and Penn State. Were our quality wins worth nothing? What about that non-conference schedule that included the likes of Duke, Wisconsin, and Vanderbilt, all top-25 RPI teams? But rather than gripe, I decided to look deeper into the seeding of a number of teams to try to determine what went wrong. I'll be the first to admit it gets pretty geeky, so if you want to skip the data, just skim down to the "Conclusions" section at the bottom to see what needs to be done to revamp the schedule and what benefits would come of it. 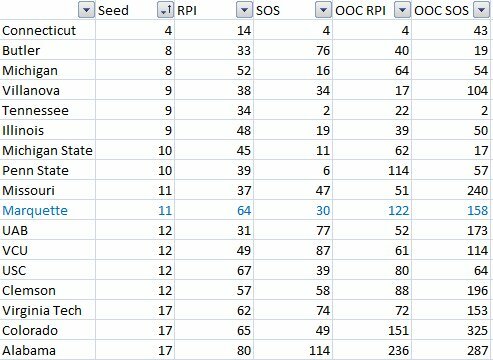 I looked at 17 different teams and compared seeding, overall RPI and SOS, out-of-conference RPI and SOS, as well as the total number of games played against non-conference opponents with an RPI of 200 or worse. The teams I included were all Big East teams with 9-9 conference records (Connecticut, Villanova, Marquete), major conference teams with .500 conference records and 13+ losses (Michigan, Illinois, Penn State, Michigan State, Tennessee), one mid-major (Butler), one team that shared a seed line with Marquette (Missouri), the four play-in teams (UAB, VCU, USC, Clemson), and three teams generally regarded as the biggest high-major “snubs” of the tournament (Virginia Tech, Alabama, Colorado). I started by looking at the RPI. While our 64 RPI indicates an 11-seed is about right, it clearly wasn’t that simple. We shared a seed-line with Missouri, whose RPI was 37. Even worse, Utah State had a 15 RPI yet was handed a 12-seed. I then factored in strength of schedule. Georgetown had the toughest schedule in the country along with a stellar 13 RPI, yet only earned a 7-seed. Tennessee, with the second toughest schedule and a 32 RPI, got a 9-seed. It’s a perfect match. And what amazed me the most was that some of the teams still had losses to 200+ teams. Tennessee, Illinois, and Penn State all earned a higher seed than Marquette despite having a sub-200 loss. But none of them played more than 4 such opponents while the Warriors played 6. The idea was that as long as the non-conference schedule is top-heavy, it can also be bottom-heavy and it will balance out. Both Marquette (projected 9) and Missouri (projected 8) used this formula and both barely made the tournament as 11-seeds, lower than projected. Virginia Tech tried it as well, but the weakness of the ACC kept them out of the field altogether. Meanwhile, teams like Villanova and Penn State focused on reducing the number of sub-200 opponents, and despite not playing any top-25 OOC opponents both earned higher seeds. What this means for Marquette is that there should be a drastic revamping of how we schedule our non-conference games. The idea that a few really good teams like Duke, Wisconsin, and Vanderbilt will offset the RPI drag of cupcakes like Centenary, Longwood, and South Dakota is simply false, especially when you are talking about 6 such games. Marquette needs to try to limit the number of 200+ RPI teams to two, with a maximum of four. In addition, teams with an RPI of 300 should absolutely be off the table. There is simply too much of an RPI drag for them to even be considered. As we reduce the number of true cupcakes, we should also reduce the number of top-25 teams we play. The risk of loss, especially in road/neutral contests, is simply too great. We should try to play at most two of these away from home per year, and then only if one is Wisconsin due to the expected home-and-home series. What we need to increase are the number of games we play against top-200 RPI teams, while also trying to add one 100-200 RPI cupcake road game per year. Critics will say that it’s impossible to predict an opponent’s RPI, we shouldn’t take the risk of losing on the road, and that scheduling better opposition is too expensive. However based on this year’s seeding, none of these points are valid. Predicting an exact RPI is impossible, but predicting a general RPI is very realistic. It’s safe to say that scheduling mid-level Horizon League opponents will yield teams in the 150-225 RPI range. In the past 5 years, no Horizon team has finished with a worse RPI than this year’s 295 Youngstown State. The Atlantic-10 is another good place to find opponents. 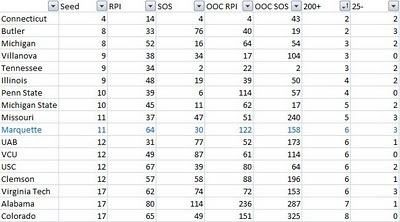 In the past 5 years, only one team has finished with a sub-300 RPI, and most have a 200 or better RPI. Conference-USA is similar. Many teams are in the top 100, while even the last-place teams rarely fall below 250. Other worthwhile targeted conferences include the Mid-American, Missouri Valley, Mountain West, West Coast, and Western Athletic. 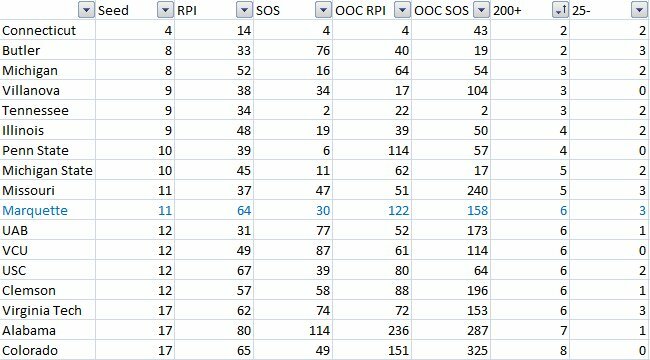 Most teams stay above 200 RPI and rarely fall below 300. Our scheduling plan should have four parts. First is the non-conference tournament. The best of these for Marquette are the CBE Classic, Coaches vs. Cancer, and the Legends Classic, because they not only provide a few quality opponents but they also grant high-major teams two home games. This will increase revenue and should help us pad our win total. The occasional high-profile tournament, such as the Maui Invitational or Old Spice Classic, is fine as long as it makes sense for the books, but it’s important to remember that these will likely cost us a home game as opposed to other tournaments. This will account for 3-4 non-conference games. The second part includes in-state rivalries. Of the three other in-state schools, the only one we should ever play on the road is Wisconsin. Our current alternating court schedule with them works fine and ensures us a high-major opponent. Both Milwaukee and Green Bay should only be played at the Bradley Center in buy games. The scheduling benefit that we get from either of them can be earned from literally hundreds of other teams around the country, while the in-state negatives if we lose a game are tangible. There’s no reason to lose face in front of our own recruits by risking a loss at the Cell or the Resch. No one will care if we lose a road game to St. Louis, but there will be plenty of media attention, hand-wringing from our own fans, and shaming coming from rivals that simply aren’t on our level. If the Badgers want to go to Green Bay or Milwaukee, let them. But as there’s no benefit, we should only play them at the Bradley Center. This will account for 1-3 non-conference games. The third part of our scheduling should be packages. Currently, we go out and put together packages with teams like Vanderbilt, North Carolina State, and LSU. While these teams all have the potential to be tournament teams, there’s just as good of odds that they won’t be. In those three series, we currently stand at 1-2 with three games left to play. We can do better. What we should do is schedule four series against teams from mid-major conferences. Each series should be a 3-for-1 deal, with the home game alternating between them so we play the same four teams each year, but play one on the road and three at the Bradley Center. As long as we target teams from the conferences mentioned earlier, we should secure opponents in the top 200 RPI, with the occasional tournament team and a reduced chance of any truly bad losses. Most seasons, even with the road game, we would likely sweep these four games, while minimizing the buy cost by giving away a home game that previously would have been at Vanderbilt or LSU, which would provide a much more hostile and difficult environment. This will account for 4 non-conference games. This brings us to the fourth and final part of our scheduling. Depending on the tournament choice and the willingness of UW-M and UW-GB to play exclusively at the Bradley Center, we are left with 2-5 non-conference games. These should be filled out as buy games either with the types of mid-majors described above or with small conference teams that meet two qualifications: having played in the NCAA tournament in the past 5 years and having been in the top 200 RPI in at least 4 of the past 5 years. Teams like Vermont, Belmont, Weber State, Siena, Murray State, and Oakland. This will account for the rest of our conference games. Scheduling is always a valid and interesting topic for discussion, and I appreciate your analysis here. However, as long as we remain in the BE, an OOC schedule such as this year's (Duke, Gonzaga, Vandy, Wisc) is fine. Our problem was that we failed to win any of those games. Coming close helped us with Pomeroy and similar ratings, not so much with RPI. As far as this year goes, I'm much happier with the 11 seed than I would be with an 8, 9, or even 10. We had *14* losses, and still avoided the play-in game. Although we're in worse position to win game 1, we have better odds to make the Sweet 16. I agree with Ben, it seems to me that you're a step closer to cracking the code that the committee uses. If you figure out the algorithm, it'd be huge! I definitely think the committee alters things slightly on a yearly basis. But while improving the RPI of our opponents would cost more (I believe an expected RPI 100-200 team is in the range of $40,000-$60,000), I think that all the benefits would end up making it worthwhile in the long run. In addition, why have the second largest budget at $10.3 million per year and not maximize what that money can do? I really feel this where we need to get the most bang for our buck, and with 6 sub-250 RPI teams on our schedule, clearly we aren't. Really enjoyed this post, BC. I hope this year's schedule was an anomaly since MU had a relatively new/young team they might have been concerned about playing too many tough teams - and when MU was stuck with Vandy, Wisco, Duke, Gonzaga, (and @UW-M, Bucknell, UWGB). Likely MU wanted to ensure walkovers in case confidence was an issue. But MU clearly over-compensated because when you look at that roster of quality OOC opponents there's no reason the team's strength of schedule should have been so lousy. 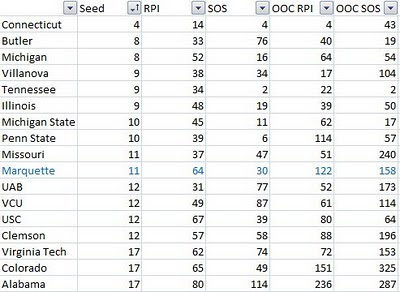 If MU would have simply avoided 250+ RPI teams they would have earned a 7 seed at least (Pomeroy ratings: presby 262, USD 290, PVA&M 338 centenary 343, mvsu 312, longwood 320)...Frankly, Presby is fine for the most part -- no issue with one game like that, even two. They were north of 275... but added to the collection of those other dogs killed any advantage MU created by scheduling the rest of what was really a solid OOC.